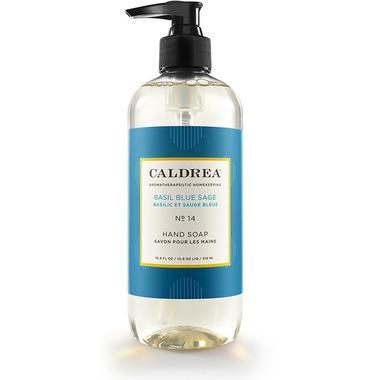 With Caldrea Basil Blue Sage Hand Soap, hands are soft, clean and fragrant as the bottle brightens kitchen or bath. Aloe Vera Gel, Olive Oil and essential oils cleanse and condition. A sprig of spring. Refined yet relaxed, this bouquet tidies your affairs with the effortless Provencal chic of its namesakes -- plus rosemary, spearmint, and cinnamon leaf.